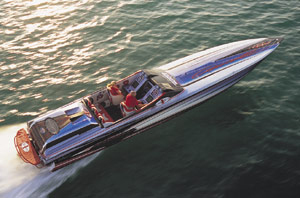 Cigarette 42x has award-winning V-bottom and delivers superb performance and craftsmanship. 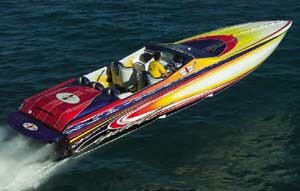 Over the past several years Cigarette Racing has never been afraid to bring us some boats with bold paint designs. Whether it was the futuristic Stealth boat in 2004 or the 42X dressed in baby blue last year, the company is willing to take artistic chances. Phil Lipschutz, the man behind the baby blue 42X creation, delivered another stunner to the Sarasota, Fla., leg of our Performance Trials from his Miami dealership, Lip-Ship Performance. 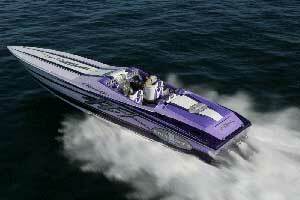 This 42-footer came in purple paint with 700-hp engines. After checking out this Lip-Ship edition 42X, color us "¦ purple. When Mercury Racing was developing the HP700SCi engine and NXT1 drive, the Fond du Lac, Wis., company used Cigarette Racing and a few other builders to test the new package. 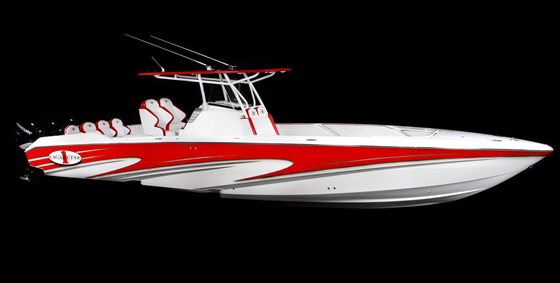 So it came as no surprise when the 42X handled the twin 700-hp motors like a champ. The 42-footer, which cost $706,000, excelled in rough offshore conditions. Both John Tomlinson and Bob Teague—the magazine's test drivers—gave the boat perfect scores in quartering, following and head-on seas. "There's nothing quite like a Cigarette in rough water," Teague said. Tomlinson added, "For a pleasure boat, I don't know if it gets any better." 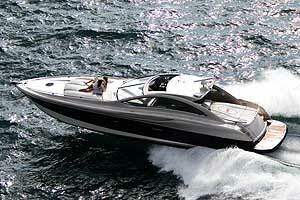 Both test drivers also praised the 42X in turns at cruising and full speed. The boat was solid in slalom drills, and tracking at all speeds was nearly perfect. We weren't sure what to expect on the top-end since this was one of our first tests with a pair of the 700-hp motors, but the V-bottom hit 100 mph on the nose with the 16 3/4" x 34" Hering five-blade propellers turning 5,200 rpm. The deep-V hull with three steps responded fairly well to the power. 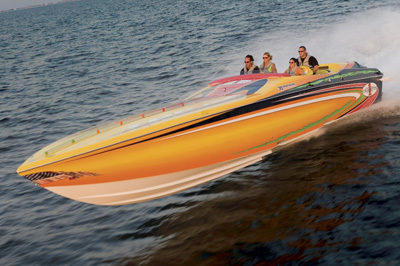 In midrange acceleration drills, the boat ran from 30 to 50 mph in 6.1 seconds, from 40 to 60 mph in 6.3 seconds and from 40 to 70 mph in 9.5 seconds—all respectable times for a 42-footer checking in at nearly 11,000 pounds. From a standing start, the 42X reached 30 mph after 10 seconds, and 10 seconds later it hit 62 mph. We did lose some visibility in the 5.5 seconds it took to reach plane with the Mercury Racing 380S K-Planes down, but on-plane visibility was terrific thanks to the clear windscreen. Overall, our workmanship inspector didn't see many boats at this year's Trials better than the 42X. Everything, in his words, was "stunning." The paint job—a $40,000 masterpiece from Grafik Worx—was obviously eye-catching, but the canvas Cigarette provided was flawless. The tooling was immaculate and the mold work was top-notch. To protect the lavender, purple, gray and black graphics, a stainless-steel rubrail was perfectly installed. Hardware on the 42-footer was kept to a minimum. Eight Accon Pull-Up cleats sat in cutouts in the deck, a pop-up navigation light was on the bow and a pair of hatches were recessed into the deck. Cigarette designed three teardrop-shape vents on each side of the engine compartment. The hatch, which raised nearly 90 degrees on hydraulic rams mounted to the transom, was painted purple to match. In fact, the entire compartment was painted purple with some of the details from the paint job included on the nonskid sole. Billet battery boxes with Cigarette logos and billet fender holders were on opposite sides of the compartment. In a staggered configuration, the metallic purple engines were secured to the stringers using Mercury race mounts and L-angles. Rigging was sanitary and well thought out. Lip-Ship Performance even included special boxes in the compartment to carry spare parts, extra oil and anything else their customer might need during a poker run, just in case something goes wrong. As usual, no matter where we looked in the cockpit, there was a Cigarette Racing Team logo. From the gauges and billet footrests to the tilt steering wheel and speaker grilles, Cigarette customized everything. At the helm, the privately labeled Livorsi Marine gauges were adorned in purple and silver bezels. The Monster GPS speedometer and tachometers were mounted in pods above the Garmin 3210C color GPS map, which was in the center of the dash. Standard gauges for the water pressure, water temperature, oil pressure and oil temperature were installed on each side of the panel to correspond with the respective motor. The remaining gauges for fuel pressure, boost and more, as well as a Mercury SmartCraft SystemView screen, were ahead of the co-pilot. 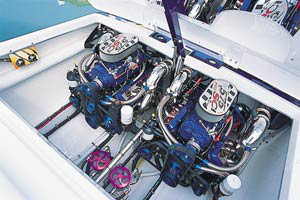 Chrome and purple shifters from Latham Marine were mounted to the left of the six-spoke steering wheel. The matching arched-base throttles to starboard featured bent levers that provided extra space between the gunwale, which Tomlinson thought was a nice touch. Seating in the cockpit included twin electric dropout bolsters on billet bases and a three-person rear bench. Along with grab handles on the back of the bolsters, Cigarette mounted single-grip handles from each gunwale for the rear passengers. Pulling double-duty, the electric cabin door had molded-in steps for deck access. Designed with the poker runner in mind, the cabin was kept simple. The forward section was divided by a zippered panel and included a head compartment and stowage lockers. Up front were facing triple-seat benches in white and purple upholstery with embroidered silver 42Xs on the headrests. Ahead of the benches were a cooler and three cupholders to starboard, and a port-side stowage compartment with a Lip-Ship edition logo. 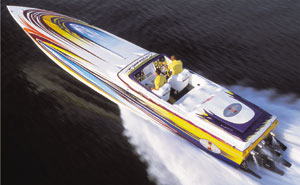 While most of our Test Team wouldn't choose purple as a primary boat color, we were all taken aback by the beauty of the 42X from Cigarette Racing. And not only was the offshore V-bottom a looker, but it truly was a pleasure to drive especially when it came to rough water.